In the call to replace_node_with_children it will call remove_node instead of remove_invalid_child, and only the latter will report the removal. This needs to be improved to report invalidity when it is being removed for that reason. I'm probably not understanding this. But it looks like when replace_node_with_children() calls remove_node(), remove_node() calls remove_invalid_child(). Is that enough to report the removed node? It catches <imgs> and <baz> and reports these 2 elements as invalid. 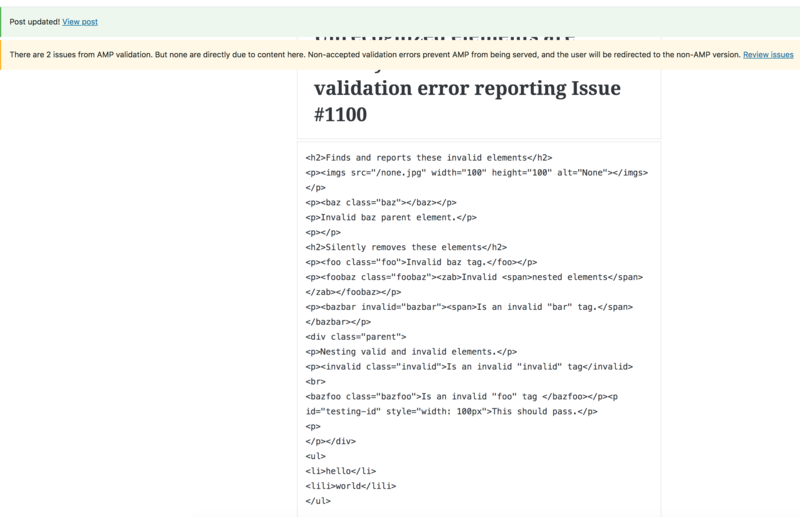 It does not catch the other invalid elements and silently removes them: <foo>, <foobaz>, <zab>, <bazbar>, <invalid>, <bazfoo>, and <lili>. There is no validation error being generated in the else for the node that's being replaced by the fragment after pushing child nodes back onto the stack. Remove unrecognized elements and report. - Prevent double-reporting nodes that are rejected. - Else, store in the `should_not_replace_nodes` property.